I am enjoying this week’s photo challenge theme – all delicious and totally calorie free. Very true! I should have really posted a cream tea! That is definitely a calorie buster! Other than a juice drink, yes I did! That big market in Barcelona is very colourful, but I’m with you on preferring a cream tea! I only thought about that once I’d scheduled this photo. I even have a photo of one! Looks so colourful and attractive. No, no , no the cream tea is upside down! A great market. One of the best I have seen. And sorry Gilly, but the cream HAS to be on top. I can feel my teeth rotting just looking at that! I imagine you’d have quite a tummy ache if you attempted to eat half of what is in this photo. I look at this at a bleary-eyed 5 am and am not at all tempted. Come 3 pm i’ll Demolish the lot! Ah, but have you tried the Haribo ones? They are sooooo fruity. No. And you can’t tempt me. 🙂 Anxious last night because I was trying to work out getting to Jerez. A quagmire of timetables and it looks like it will take most of the day to get there by public transport so Mick has opted to drive. Which makes me anxious all over again. 🙂 It’s just the driving into the city part (she says!) but I’ll research, and we only have to do it once. 🙂 Next Wednesday. Getting excited. Mmmm… just had a look at the map. It’s not so far from you is it, but no coastal road so it looks as though you’ll have to drive via Seville. How long are you staying there for? Hotel? Parking? At least Mick is used to driving over there. I’d be panicking! So pretty and colorful…and I wont gain any weight! 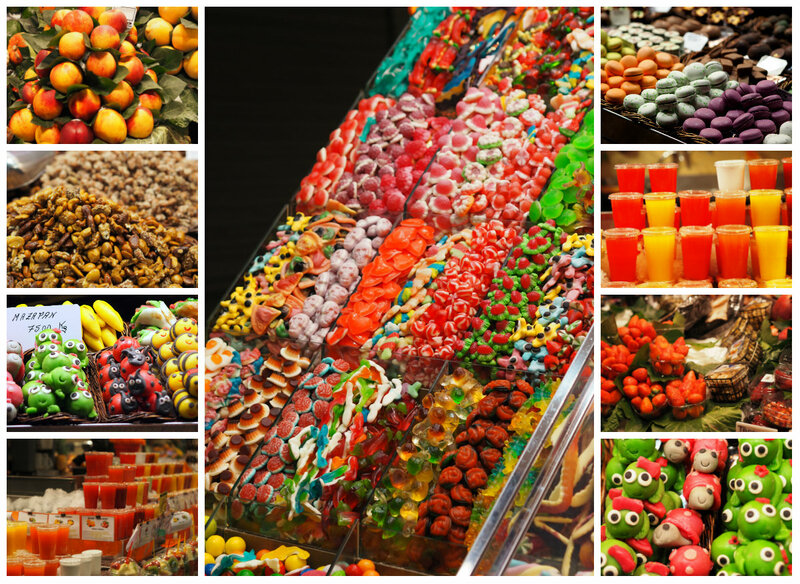 I love taking pictures of food/treat stands…often so so colorful and pleasing to the eye. Not sure about the not gaining weight. I think I do by simply looking at food!! So vibrant. love how you have put this together Jude. They look so tempting. Is this the Boqueria market? If not, I saw a display or two just like this when I visited it. I managed to resist temptation – mainly because we were going to be stopping for hot chocolate and churros later! Who can blame you. There is a café here that serves them. I might have to pay it a visit.